I bit the hell out of the backs of my fingers yesterday. That's not something I often do, but yesterday set me down the road to some advanced agro stimming. The last month has had too many things in it and I don't know how to manage. Yesterday, it was all too much. I had to do something. There were no suitable textures to run my fingers along during my walk from the afternoon traumatic experience (which I'm still having trouble processing) to the normally pleasant evening appointment with my daughter. Part of my problem was anxiety over whether I'd have to interact with my ex-wife. But that was only part. Other parts were things that happened four and twelve years ago. Also, I recently started dating someone and... my social-emotional batteries were just cashed out and I felt horrible. And my dentist told me years ago that I shouldn't clench my teeth because it causes the enamel to flake off. So I bit the backs of each of my fingers. Hard. Not so hard to draw blood, but hard. The quietest, most aggressive stim I could do, and it helped, but it wasn't quite enough. I think the goal was to turn the elusive, internal, undefinable, unapproachable pain into something external. Something I could see and release. I don't know. It was just the thing to do. There's so much too much going on. I'm not dealing with it well. I can tell. 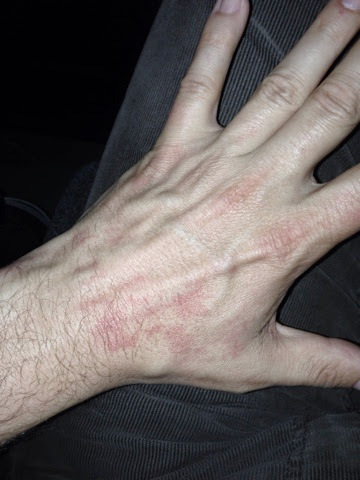 Bite marks on my fingers. Claw marks on my arms. An hour here or there catatonic and unable to move or speak while my daughter watched movies with my housemates. It feels the most horrible. I think it's what they call a meltdown. I've had worse, but dammit! How do I make it go away when it starts? How do I make it go away?